REEM-C is a life size humanoid robot developed by PAL Robotics to serve as a research platform for universities and research institutions. The robot has ten CAN interfaces. REEM-C is designed to be a tool for robotics researchers, in order to enable technological advances in the field. The biped robot is suitable for fields such as dynamic walking, navigation, human-robot interaction, speech recognition, object manipulation, and whole body balancing. 1,65 m tall and weighing 80 kg, the robot comes with modular hardware architecture and open-source software that make it easy to program and customize, says the company. The humanoid can lift and carry 10 kg with both arms and 1 kg with one hand when the arm is fully extended. One of its assets is the long autonomy: it can remain fully operational for three hours, or in standby for up to six straight hours. REEM-C is a self-contained robot that works out of the box. The platform has built-in and ready-to-use functionalities, such as walking, navigation, sitting down, climbing stairs, object recognition, and grasping. The robot recognizes the environment in which it is located, people around it, and objects within its reach. The robot is completely integrated with ROS (Robot Operating System), the most common open-source middleware for robots. ROS offers a set of libraries and tools, such as drivers, algorithms, and the integration with Gazebo 3D simulator, for the development of complex applications. REEM-C simulation is open-source and available online. REEM-C has a total of 30 degrees of freedom, distributed through its body: on its head, arms, legs, waist, and hips. Besides, each of the two five-fingered hands counts with 19 degrees if freedom. The humanoid hands are underactuated and mechanically compliant, allowing them to adapt to the object the robot is manipulating – even non-rigid materials like clothes. The robot comes with sonars and cameras to map its environment and perform path planning while avoiding obstacles. Force/Torque sensors enable REEM-C to maintain its body balance. Onboard cameras, microphones, and speakers give the robot human-robot interaction skills, such as face recognition, the ability to speak in more than ten languages, and voice recognition. Many optional sensors are also available to extend its functionalities, such as lasers and inertial measurement units. Via a CAN network, all motors and sensors of the robot communicate with the PC that controls it. The company’s robots always have more than one CAN interface. REEM-C comes with 10. This PAL Robotics platform is one of the few humanoid bipedal robots with this kind of features available for sale. The robot is suitable for educational activities and research purposes in multiple fields. Researchers and students are able to focus on the development of new algorithms and applications. PAL Robotics designed the robot to have almost the same mobility as a person, which explains the platform’s complexity and the great care that was necessary during the design to optimize the components’ power-to-weight ratio. 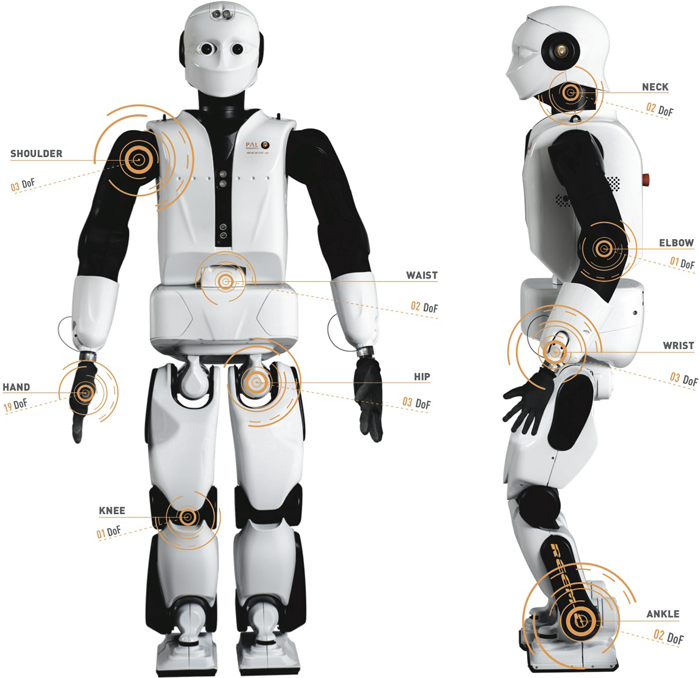 Its range of joints and sensors allows the humanoid to perform a set of movements such as climbing stairs, sitting down, or picking up things from the floor.